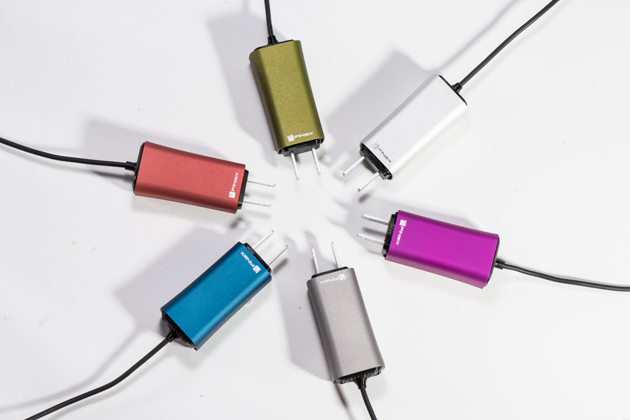 Back at CES in January, MIT spin-off FINsix unveiled the "world's smallest" 65W laptop adapter, and it even managed to nab a nomination for our Best Startup award. Fast forward to today, the company is launching this nifty device -- now dubbed the Dart -- on Kickstarter for as low as $79 per unit. Here's a quick reminder: this charger is four times smaller and six times lighter than its regular counterparts, and it also comes with a 2.1A USB port. The enabling technology here is a highly efficient VHF (very high frequency) power conversion, as refined and patented by MIT. As you'd expect, the Dart is compatible with most laptops, and there's even a special version for MacBooks that don't need more than 65W of power. The first 1,000 backers will be able to grab a standard Dart for just $79 a pop, and latecomers will only have to fork out an extra $10 per piece. Both lots are cheaper than the $119 retail price, but rather than arriving in the summer as expected, these won't be shipped until November -- following product certification and field tests in the earlier months, of course. As for the limited MacBook version due December, the first 500 units will cost a staggering $148 each, followed by $168 each for the remaining 1,500 units. FINsix explained that this huge price bump is because it has to buy the original MacBook adapters (also $79 each), in order to repurpose the MagSafe and MagSafe 2 connectors for its Darts. The good news is that FINsix is also hoping to work out a long-term agreement with Apple, in order to offer the MagSafe Dart at a much lower price. For this Kickstarter campaign, the Dart's aluminum body will be available in either blue, magenta, silver, gunmetal or orange. The device is built with a US plug, but it'll work with different voltages and frequencies around the world, so non-US folks can just add a plug adapter. Since the Dart is geared towards road warriors, chances are its backers already have a travel adapter, anyway. FINsix has also previously told us that it's quite easy to scale the Dart in terms of power output, so here's hoping that the startup will consider a 90W or even a 150W version, for the sake of those chunky mobile workstation bricks.